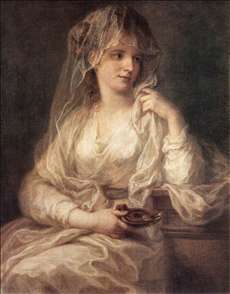 Angelica (Maria Anna Catharina) Kauffmann was a Swiss painter in the early Neoclassical style who is best known for her decorative wall paintings for residences designed by Robert Adam. The daughter of Johann Joseph Kauffmann, a painter, Angelica was a precocious child and a talented musician and painter by her 12th year. Her early paintings were influenced by the French Rococo works of Henri Gravelot and Franois Boucher. In 1754 and 1763 she visited Italy, and while in Rome she was influenced by the Neoclassicism of Anton Raphael Mengs. She was induced by Lady Wentworth, wife of the English ambassador, to accompany her to London in 1766. She was well received and was particularly favoured by the royal family. Sir Joshua Reynolds became a close friend, and most of the numerous portraits and self-portraits done in her English period were influenced by his style of portrait painting. Her name is found among the signatories to the petition for the establishment of the Royal Academy, and in its first catalogue of 1769 she is listed as a member. During the 1770s Kauffmann was one of a team of artists who supplied the painted decorations for Adam-designed interiors (e.g., the house at 20 Portman Square, London; now the Courtauld Institute Galleries). 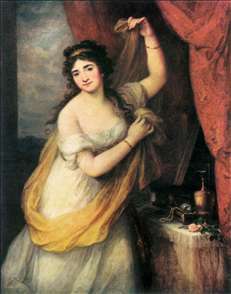 Kauffmann retired to Rome in the early 1780s with her second husband, the Venetian painter Antonio Zucchi. Kauffmann s pastoral and mythological compositions portray gods and goddesses in a delicate and graceful if somewhat insipid fashion. Her paintings are Rococo in tone and approach, though her figures are given Neoclassical poses and draperies. Kauffmann s portraits of female sitters are among her finest works. See more details about "Portrait of a Woman Dressed as Vestal Virgin"